New Precious Carat Lip Gloss from Lancome is the definition of the perfect holiday gift for the girl who loves, well, pretty things. It's totally adorable, functional (who doesn't love lip gloss? ), reasonably priced, and definitely something she doesn't already have. The perfect conversation piece to display on a vanity or fish out of a Chanel purse for touchups at a party. But, lip gloss it is, at least for this year (hey Lancome! maybe a solid perfume jewel next holiday season?). 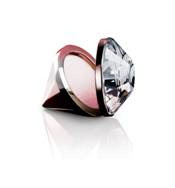 This Swarovski crystal topped jewel is filled with Diamond Splendour lip gloss, a transparent, sparkly shade that can be worn alone or layered over lipstick. So scoop up some of these lovely jewels as gifts for all your fabulous friends this year...just don't forget to pick one up for yourself!